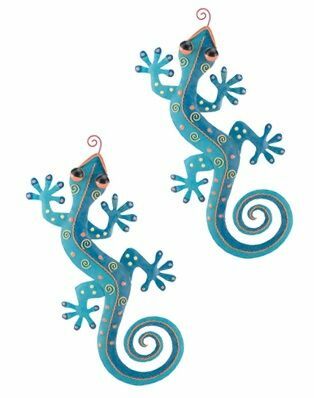 Make the leap into your garden paradise with the help of our magnificent pair of Blue 20" Geckos Wall Art! Each of these unique metal Geckos has been hand crafted and hand-painted with vibrant colors and tropical detail. The Gecko sculpture also comes ready to hang outdoors on your garden walls with attached hooks on the back so you can set them up in various angles. Made of metal with quality in mind, these Gecko decorations make a great home decor and garden gift that can be enjoyed for years!